Cindy: Two of my neighbors have these beautiful flowers in the yards. Neither of them know the name. I have searched the internet to no avail. I was hoping you could help. 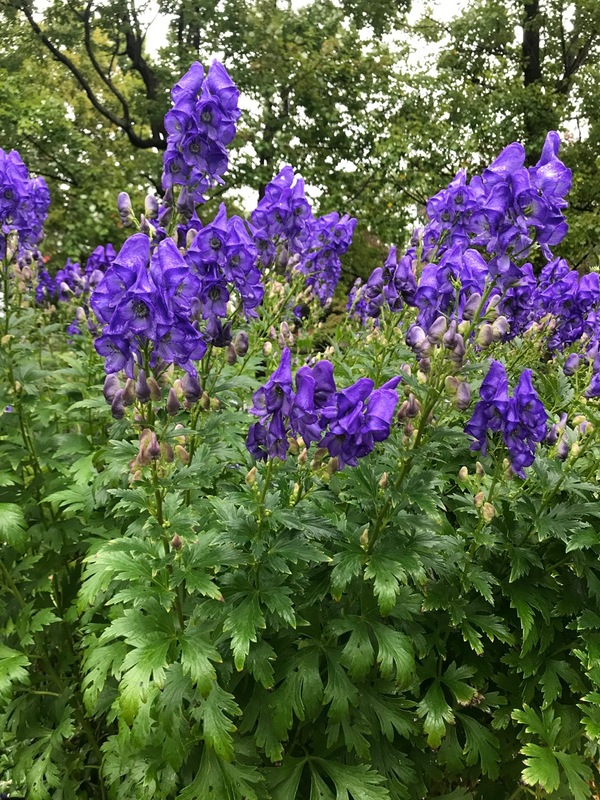 They bloom late fall and are approximately 24-36 inches tall. Doug: Those are a tall version of bellflowers or campanula. I’m not sure which variety as there are many. It’s an easy-to-grow perennial that will grow just about anywhere, but it prefers sun. Melissa: I planted three sweet potato vines for decoration (spiller) in a kettle. We just dug them up due to frost and found five nice-sized potatoes or roots. Are they edible? Doug: Technically they are edible, but probably not very tasty. They could be saved for next year’s garden though. Just put them in a container with some vermiculite or peat moss in a way they don’t touch each other. They can be stored in a cool, dry place until being planted out after all chance of frost has passed. Chuck: I want to start planting garlic and was wondering if deer will eat the green tops as they grow? And if so, how can I deter that other than fencing. Doug: You don’t have to worry about the deer eating garlic or anything else in the onion family … they don’t touch it. Some people actually plant garlic with other crops to try and keep the deer at bay with mixed results. Besides fencing, I use Bobbex. It smells, but it keeps the deer off plants. Mary: Is it OK to put used potting soil into my composter? Doug: Yes, it’s a great thing to add. I’ve got some friends who also save it and grow potatoes in the medium. Kathy: My friend heard part of your radio broadcast about wintering dahlias. She told me what she remembered. Allow dahlias to turn black after frost, cut and discard stem and leaves, let tubers remain in ground and cover the ground with aluminum foil for two weeks. Then remove tubers and save only the ones with an “eye” on them . Am I correct so far? What is the advantage of foil? (Hope your answer is not related to outer space alien abduction!) I’ve been placing my tubers in buckets and cover with peat moss, place in a dark area of my garage and replant in the spring. Doug: Your friend got everything right. The foil is put over the stems. Since they are hollow, we’re trying to stop water from seeping into the tuber. Everyone saves their tubers differently; if you are getting good results and plenty of flowers, keep doing what you’re doing. Leaving them in the ground for a couple weeks makes the eyes easier to see. Without eyes (like on a potato), the tuber won’t flower.